Goat anti Human, Mouse, Rat MIF. Peptide with sequence from the C Terminus of the protein sequence according to NP_002406.1. Calculated Molecular Weight: 12.5kDa (NP_002406.1). Peptide ELISA: 1/128000 (Detection Limit). 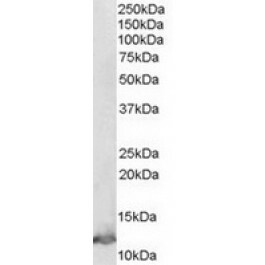 Western Blot: 0.01-0.03 µg/ml. A band of Approx 13kDa is detected in Human Lymph Node and Thymus lysates. Enzyme Immunoassay: Sandwich-type ELISA with increasing amount of recombinant MIF captured by a rabbit antibody. Recommended reporter concentration: 1.5-3 µg/ml. MIF is a proinflammatory cytokine involved in many inflammatory reactions and disorders. MIF (macrophage migration inhibitory factor) was one of the first cytokines to be discovered and was initially described as a T cell-derived factor that inhibits the random migration of macrophages (Weiser 1989). Recently, MIF was rediscovered as a pituitary hormone that act as the counterregulatory hormone for glucocorticoid action within the immune system (Bernhagen 1993, Mitchell 1995). MIF was released from macrophages and T cells in response to physiological concentrations of glucocorticoids. The secreted MIF counter-regulates the immunosuppressive effects of steroids on immune cell activation and cytokine production (Bucala 1998). MIF plays a critical role in the host control of inflammation and immunity. MIF is involved in both autoimmune disorders and tumorigenesis. Ammonium Sulphate Precipitation followed by antigen Affinity Chromatography using the immunizing peptide. Tris buffered saline, pH~7.3 containing 0.02% Sodium Azide as preservative and 0.5% BSA as stabilizer. This antibody recognizes Macrophage migration inhibitory factor.